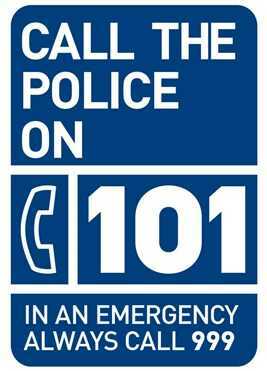 The non-emergency number to contact your local police force is 101. It is for situations that are less urgent than a 999 call in England, Scotland, Wales, or in Northern Ireland. 101 POLICE NUMBER: There are specific instances when you should call 'one zero one' instead of '999'. Calling 101 should be for concerns that do not require an emergency response. If your property gets damaged. If you suspect drug use or drug dealing in your neighbourhood. To give the police some information about crime in your area. To speak to a police officer about a general enquiry. Note: Always call 999 for any emergency situation. Do not call 101 to report a crime in progress or if someone suspected of a crime is nearby. The 999 emergency number is for reporting danger to life or acts of violence. Note: In most cases, you should contact your local council about general nuisance and environmental issues in your area. As a rule, the cost of calls to 101 is 15 pence per call (from mobile networks and landlines). The price is set at 15p no matter what time of day or how long you stay on the phone. The charge goes to the telephony providers. It covers the cost for them to carry the calls. The police, nor the government, do no get any money from calls to 101. Where Can You Call 101? The 'one zero one' number is only available if you make the call from within England, Scotland, Wales, or Northern Ireland. You can use the list of non-emergency numbers if you need to contact one of the police forces from a country overseas. Who Answers 101 Phone Calls? The system determines your location and connects you to the police force that covers your area. A recorded message announces which of the police forces you are getting connected to. The recorded message then gives you an option to choose a force to get connected to. Police officers and control room staff answer the calls. It means staff with local knowledge can answer the call and make an appropriate response. Can deaf people, those who are hard of hearing, or speech impaired use the 101 police non emergency number? Yes, because they can textphone 18001 101. What about people who do not speak English as their first language? The police have access to professional interpreters. They can arrange a translator for people who have difficulty speaking English. What can I do if my workplace or premises have blocked the 101 number? Some business phone systems and switchboards may not yet recognise the 'new' number. The phone system administrators may need to open it up or you can use the non-emergency number list.